carriewriterblog: Dan in Real Life...Not So Much? 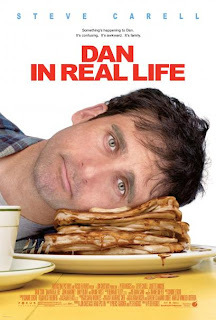 Dan in Real Life...Not So Much? We recently viewed a second run of this film, and I'm really glad we only paid $1.50 each. I looked at some of the reviews of this film before writing this just our of curiosity, and the comments ranged from things like "worst script ever," to "a pleasant movie." Anyone who has seen this will understand why the reactions range from "yuck," to "not bad," to "this would be better on an airplane." The movie is about a widowed father, Dan (Carell), with three daughters. During a family reunion, Dan meets the woman of his dreams at a book store. But when he gets to his parents' house, of course the woman ( a cute but I like her in more dramatic roles Juliette Binoche) is already there. And [cue the dramatic music] she's his brother's (Cook) girlfriend. Ooh, the plot thickens! The rest of the movie consists of Dan and Binoche trying to not be a. awkward around each other b.attracted to each other c. obvious about all this to anyone else, anyone else being the bevy of family that surrounds Dan throughout the movie and acts as a Greek chorus of morality throughout, as they scrutinize every aspect of his behavior, which is amazing since one would think they have their own lives to manage. (Good Dan, bad Dan, Dan needs to get a life, why is Dan acting so strange, etc.) It seemed to me that Dan's biggest problem was not falling in love again to move on with his life after his previous wife had died 4 years ago, but getting some respect from his troublesome teenage daughters (dad, you have murdered love! ), and his mother, who has him sleeping in the laundry room and makes him wash all the dinner dishes by hand when he acts up during supper. Why does he put up with all this, ie. why is he such a wimp? The movie does have some cute scenes and Carell is somewhat appealing as a semidrifting dad, but they are offset by scenes that made me cringe, like the family doing group aerobics outside the house one morning, and gender oriented activities like male vs. female crossword puzzle projects (does anyone do this? ); and a family "talent" show that allows Dan to sing a heartrending version of "Let My Love Open the Door," thus winning over Binoche Partridge Family style. One wonders how, with a hip screenwriter like Peter Hedges, an entire family reunion weekend reveals not one mention of a computer, not to mention a cell phone or any other sign of this modern era, except for the cell phone Binoche uses to call Dan after she has run away from the family reunion early, much like the viewer of this film wishes she could have done.